Bishop Frank Caggiano of the Diocese of Bridgeport. FAIRFIELD — Two priests who once served in a local parish and at Sacred Heart University were added to the list of “credibly accused” clergy for sexual abuse of minors in the Bridgeport Diocese. Bishop Frank Caggiano, in a March 22 statement, added 10 names to a list of nearly 30 priests, living and dead, who are accused of sexual abuse and at some point served in the Diocese of Bridgeport. 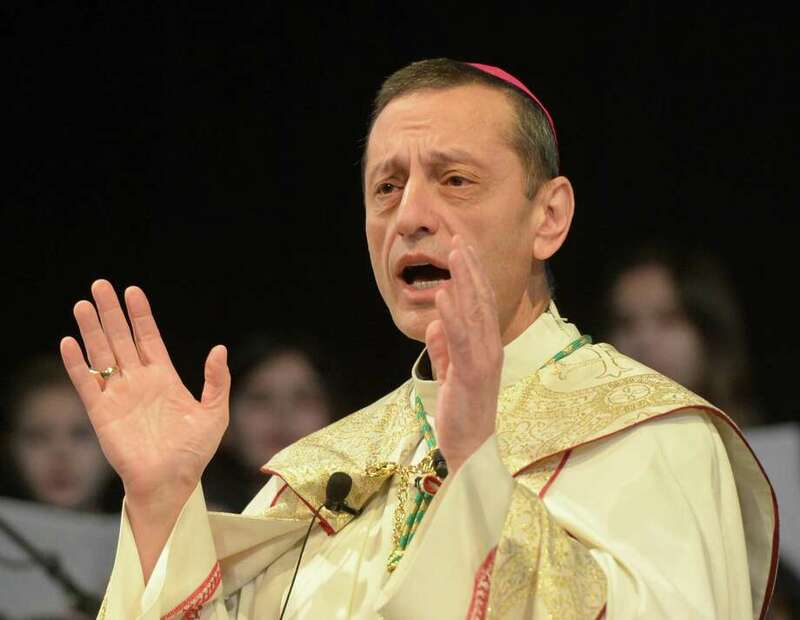 “It is with much regret and concern for all those who are survivors of sexual abuse that I must announce that the following ten clergy who served in the Diocese of Bridgeport have been added to our list of Credibly Accused Clergy,” Caggiano wrote. Rev. John Draper and Rev. William Fletcher are among those added to the list. Both served at St. Thomas Aquinas Parish at 1719 Post Road, according to Caggiano’s statement. Draper served at the local parish in 1963, according to Tremont Sheldon Robinson Mahoney, a Bridgeport law firm that has represented dozens of abuse victims in lawsuits against the diocese since 1993. Fletcher, ordained in 1944, served in various parishes in Connecticut, including St. Thomas Aquinas, where he served from 1958 to 1963, according to a website that cites the Official Catholic Directory. A St. Thomas representative, when reached by phone Thursday, said the Rev. Victor Martin, pastor of the local parish, was unavailable for comment. Fletcher also “spent most of his career at Sacred Heart University until his death in 1988,” according to Caggiano. A report from 2006 said Fletcher taught anthropology and sociology at SHU and chaired the university’s cultural affairs committee. At 2 p.m. Thursday, Kim Swartz, an SHU representative, said the university’s Human Resources records did not go back to the 1970s — when Fletcher was reportedly at SHU — and could not confirm questions about Fletcher’s tenure. The single allegation against Fletcher involved a then-14-year-old girl back in 1964 when he was serving at St. Margaret Mary Parish in nearby Shelton. The victim sued the Bridgeport Diocese in 2006, alleging Fletcher molested and sexually assaulted her, according to reporting at that time. In October last year, Caggiano appointed Robert Holzberg, a retired state judge, to delve into allegations that the diocese had covered up sexual abuse by priests for years. “As a part of Retired Superior Court Judge Holzberg’s investigation into clergy sexual abuse of minors and the Diocesan response to that abuse, a hotline has been established for those who wish to communicate with the Judge and his team,” the message reads. Only last month, the Bridgeport Diocese settled a case for $3.55 million to five men who claimed they had been sexually abused by priests when they were children.